Today’s gadget that I get to review comes from Gamesir, and it is meant for the gamers. Not just any gamers, mind you, but those who were champs at MMO keyboard controllers, and want some of that sweet, sweet action on not only their PC but the Xbox One, PS4, or even the Nintendo Switch. 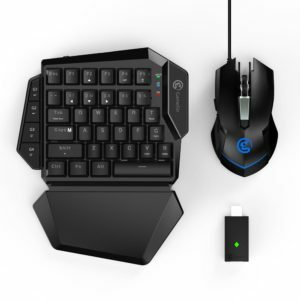 I’m going to be honest and say that this device is not for me, but this is because even though I have played a lot of MMO games using this type of control, with the WASD and mouse for camera movements, I am not really comfortable with it. However, there is an audience that was practically raised with this type of controls, and I have heard that this type of controls can give you an advantage, possibly unfair. After all, there are some games that require a lot of complex button mashing in order to do something that might have to be done with split-second timing, such as changing a weapon. However, you can see that the Gamesir VX AimSwitch has that half-keyboard, which is capable of turning a complex action into a simple macro. The end result is one touch gaming actions which could make all the difference in certain gaming scenarios. I had a chance to test it out, and I was pretty impressed at how easy it was to set up. I have the PS4 and the Switch, and I need to let you know, if you want to set it up, then for gosh’s sake, follow the instructions. I found that setting it up for both of these systems required me to read the instructions, so it isn’t exactly instinct. I did find that when I got the controllers to work for both Horizon Zero Dawn (PS4) and Super Mario Odyssey (Switch), there was a bit of a learning curve as I had to figure out what buttons did what. Those that want this kind of keyboard controlling action will love this, but those that love the “native” controllers might want to go back to these wireless roots. If you are of the type who desires this type of gameplay, feel free to head over to the Gamesir site and pay $99.99 for it.